Male Hair Loss Treatment – Prevention is Better Than A Cure! Male hair loss, also known as male pattern balding or androgenic alopecia affects most men at some stage in their life. It is a genetic condition that is passed down from one or both parents, that leads to gradual thinning of the hair, but there are male hair loss treatments available. Although many men accept their hair loss as a natural part of the ageing process, others find it distressing and seek ways to prevent further shedding and/or encourage regrowth. The good news is that if started early enough, pattern balding responds well to male hair loss treatment and further thinning and receding can be prevented. The key is to start a prevention programme before too much has been lost. Male Hair Loss Treatment - contact us now to discuss your requirements. 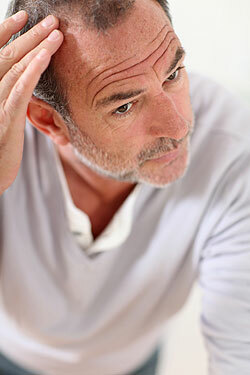 Hair loss follows a similar pattern on all men, which is why it is commonly referred to as male pattern baldness. The first sign of hair loss is a receding hairline and this can happen to men at any age from their early twenties upwards. As the hairline starts to recede, men will also notice a gradual thinning on top. This leads to a bald patch gradually developing in the middle of the scalp. As the condition advances further, the receding hairline and bald patch join together to leave just a rim of hair around the back and sides of the scalp. This can in some cases thin away too, leaving the man completely bald. The rate at how fast the hair loss will occur depends on a number of factors. If the man has received the hair loss gene from both parents, then this is likely to speed the process up. Also certain lifestyle choices, for example smoking, heavy drinking, lack of exercise or a poor diet may also quicken the balding. For the best possible results, book a consultation as soon as you notice the first signs of thinning or receding. During your consultation, your scalp will be looked at through an instrument called a Proscope. This is a magnifier, which is connected to a computer and allows the trichologist who is examining your scalp to see detailed pictures on the monitor. These images can be saved for comparison at a later date when you return for a check up. In addition to looking at your hair and scalp you will also be asked general questions about your health, medications, diet, family history and lifestyle. At this point you will be able to discuss any treatments for hair loss or products you have tried or are currently using. Your trichologist will not contact your GP and in most cases your hair loss can be treated without you visiting them. Only in rare cases where it is believed that your hair loss is caused by a medical condition or as a side effect of certain medications you are taking, will you be referred back to your doctor. Once your diagnosis appointment has been carried out you will be advised if your hair loss is treatable and the best course of action to follow. There is a wide range of male hair loss treatments available on the market from prescription medicines to herbal remedies to hair loss shampoos. Treatments are used to boost circulation to the scalp, strengthen the hair follicles, block the hormone DHT from formulating in root follicles and cleanse the hair root. Here, at the London Centre of Trichology, we offer a range of natural hair loss prevention treatments that are tailored to each client’s individual requirements. Male hair loss treatment will stop further thinning and follicle miniaturisation, and in some cases the client will experience hair re-growth. There are no side effects to any of the treatments we offer. A man will need to follow a course for our treatment for a minimum of 6 months, to see results. This is especially important where the hair loss is genetic. Male Hair Loss Prevention - contact us today for a free initial consultation.